The winner of the signed copy of MALICE AT THE PALACE is Karen in Ohio! JULIA SPENCER-FLEMING: August must be the month for fabulous historical fiction! 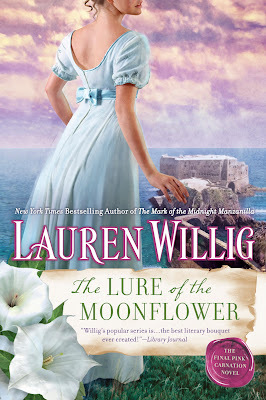 Our own Rhys Bowen with her ninth Her Royal Spyness mystery, MALICE AT THE PALACE, and the writealicious Lauren Willig with the last (sob) of her Pink Carnation Series, THE LURE OF THE MOONFLOWER were both released yesterday! If you're one of the few readers who hasn't discovered Lauren's hard-to-pin-down series (Humorous Romantic Napoleonic-era-romp Spy Thrillers/Academic Mysteries) you must leave your computer, hie to your local independent bookstore, and purchase them immediately. Okay, done? You're back? Good. 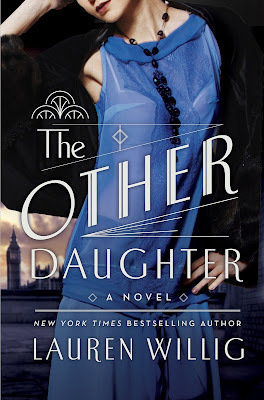 Because not only has Lauren made the HRN-e-rST/AM genre her own, she's also been writing beautiful stand-alone historical fiction weaving mystery and romance with intriguing settings like colonial Kenya, the Pre-Raphaelite movement and, in THE OTHER DAUGHTER, the Bright Young Things of 1920's England. Did I mention THE LURE OF THE MOONFLOWER and THE OTHER DAUGHTER came out only two weeks apart? And that Lauren has a toddler at home? And that she wrote her first book, THE SECRET HISTORY OF THE PINK CARNATION, while she was in Harvard Law School? Just typing that made me tired. We Reds may consider giving up writing our books and just let Lauren handle everything for us. Hi, Jungle Reds! Thanks so much for having me back here. Whenever I visit, I feel like I’m sinking into a cracked leather sofa in a good friend’s den. It’s a place to kick back with a drink in your hand, a shoe dangling off your toe, and a long, deep breath. I could use a long, deep breath right now. I’ve had two book releases in two weeks: on July 21, The Other Daughter, a 1920s stand alone novel (my attempt to see what would happen if I tried to channel Mary Stewart and Evelyn Waugh, add a lot of caffeine, and stir), and now, yesterday, The Lure of the Moonflower, the twelfth and final book in my Pink Carnation series. Can you tip that bottle of wine over my glass again? Thanks. The adjective that seems to constantly attach itself to the Pink series is long-running. (Although, really, when it comes to long-running, I’ve got nothing on Deb! I raise my glass to you, sweetie.) I’m deeply bemused by this. I wrote the first Pink Carnation book, way back in 2001, as a way to avoid writing my dissertation. It was a lark, an inside joke, a swashbuckler gone Blackadder with spies swinging through windows, Napoleon being soundly put in his place (by a chaperone with a purple parasol), the odd heaving bosom, and a few comic sheep. But a publisher saw it as something more than a private amusement and signed me up to write another one. And then another one. And a few more. So here we are. With the Pink series in my rearview mirror—so to speak—I’m thinking about series, the care and feeding thereof. Close-ended series, open-ended series, ongoing protagonist series, barely tied together series, and those series that are really just one book told in multiple installments. To be honest, I’m pretty glad that it all happened by accident, because there was no way, back in 2001, that I could have planned half of that. I’m a big believer in the chaos theory of writing: that the stories you stumble into in that dark closet of your mind, tripping over spare characters, and sending odd bits of plot crashing around and banging you in the back of the head, are much more interesting than the ones you keep carefully dusted on your shelf, ready for use. But now that my Pink series is done, I’m in the position of having to figure out what to do next. Theoretically, writing a series ought to have taught me Deep Writing Lessons that can be applied to my next venture, whatever that might be. The problem is… I’m not sure what those are. I’ve been punting the question by writing stand alone novels, each of which is its own unique structural challenge—and rather makes me miss the comfort of sinking into the familiar world of a series. Of course, while I was writing my series, I complained I didn’t have enough time to experiment with new plots, characters, and time periods, so this is definitely a case of beware of what you wish for. The manuscript is always inkier? So what do you think? Do you prefer open-ended series or close-ended series? Do you think series ought to be planned in advance or develop as they go along? If you were to restart your writing career from scratch tomorrow and could write anything you liked, what would you choose? 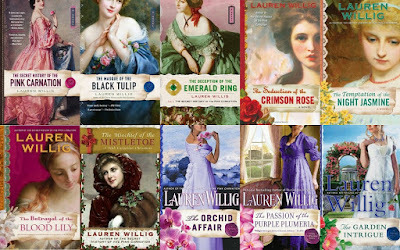 You can find out more about Lauren Willig at her website, where you can also see the whole list of the Pink Carnation series in order, and read excerpts of The Lure of the Moonflower and The Other Daughter. You can friend Lauren on Facebook, follow her on Twitter as @LaurenWillig, and read lots of extra tidbits and book discussions on her blog, cleverly disguised as the News on her website. Congratulations, Lauren --- both books sound yummy! Can't wait to read them, although there's a certain amount of sadness at seeing the Pink Carnation series come to an end . . . . I do wonder about the whole planning thing, though: even if you planned in advance, I would think that after several books the story would have elements of both planning and of developing as the series goes along. Two books released in two weeks - Wow! Congratulations!! Putting these on my TBR list. As a writer, I can barely see to the end of a book, never mind to the end of a series of books. If I had to do that it would be cruel and unusual punishment. And my books are personal, they reflect where I am at that given point in time... not something which, I'm happy to say, I can predict. I don't have a preference for series vs. stand-alone. I really like the comfort of sinking into a series with old friends, but I like meeting new friends, too. As for how much planning in a series, well, obviously J.K. Rowling had to do a lot of planning because she always said, "there are 7 books and that will be The End." So if you're doing that, I'd guess you need more planning to make sure you don't leave any plot threads loose and flapping in the wind. But an open-ended series? I can see having a "loose" plan (i.e., this has to happen about here), but you're more free to follow the delightful paths that your characters lead you down as they grow. And chaos-theory of writing? Love it. I am a big Mary Stewart fan, so to find someone in this day and age who acknowledges her writing is a huge incentive to seek out The Other Daughter immediately! And humor goes a long way with me, so now I have a new series to fill in the nooks and crannies of my days. Seriously, I think the chaos theory of writing also explains your productivity--if you sat down and tried to plan all of that ahead, you'd just say, "Can't be done," and crawl in next to the napping baby. Closed series are hard--if the caliber of writing is high--because you don't want the series to end at all--case in point, Harry Potter. Open-ended series are great, unless you get an author who runs out of steam before they run out of a contract--or their heirs run out of a contract. I needed another series of books to add to the reading pile like I needed...well, you understand. The Pink Carnation series sounds very good and like FChurch, Mary Stewart is a particular favorite, so the new stand-alone is intriguing as well. And then the mention of a per-Rapheilite book - oh how I love that period. As for the topic of the day, I love both series and stand-alones. I do feel that some series go on too long beyond their sell-buy date. Some of those authors could learn a bit by reading the series of the JRW, as they are doing things right. As sad as I am to see a series end, sometimes when it feels "right," it can be very rewarding. I'm a firm believer in chaos myself. Somehow it always sorts itself out eventually. Sorry to see the series end. I've been a huge fan from the first. I'm reading Lure of the Moonflower now and you had me hooked even before the end of the Prologue, which has, by the way, one heck of a hook! Ohm so eager to read this!Someone recently--who,I cannot remember, but what else is new--was raving about your books. Lauren..so this is certainly a sign for me to get reading. And yes, the end of series..so wise when authors see it! Hi Lauren! 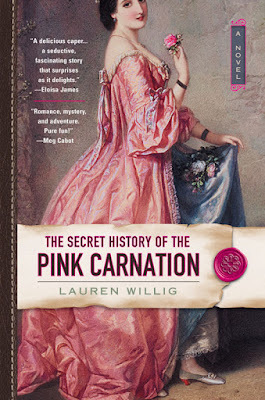 I love the Pink Carnation books, so I'm happy (new book!) and sad (no more?) I'm trying to think how I discovered your books...Oh! It was Barbara Peters, the world's best bookseller. I was signing there and she said, "You'd love these." She's always right, too, and I end up shipping a case of books home.. But--I'm also a HUGE Mary Stewart fan and I am so intrigued by The Other Woman (going to buy asap) and I love the Pre-Raphaelites, and Kenya, so I can see you're doing a lot of other things during those short baby naps that I want to read. I do love series novels, both open-ended and close-ended, and I personally have never really been inspired to write a standalone because I get to do so many different things in my books. And it's a very open-ended series. I usually have some idea of what I THINK will happen a book or two ahead, that's about it. And now that we've talked about the napping baby myth, can we talk about the "baby that goes down at 7 and sleeps for 12 hours" myth. Really????? Reading it now. :) I get my must-read books in Kindle --- so I can read it immediately upon release -- and in paper/hardcover so I can add it to my collection. My first book was published when Youngest was 7 months old, so I have a lot of experience with baby+writing. I still had the day job, then; I would write from 4:30-6:30am, then get kids up for school and daycare and hie myself off to work. After I'd gotten the contract for the 3rd and 4th Clare Fergusson books, I left the law and foolishly took Youngest out of full-time day care. I had been seduced by the image of writing while she was napping or playing quietly, and felt sure I could get it all done on the Tuesdays and Thursdays she was at the preschool. After two months of getting nothing done on my book, I sent her back to preschool. (Ross was teaching at the nearby elementary school and could pick her up at three, which helped assuage my mommy guilt.) Since she's gained admission to the 14th best public high school in the country, I'm feeling a little more comfortable with my decision. Evidently, day care didn't ruin her life after all. Welcome, Lauren! All I can say is I adore your books and am deliberately going to read this one slowly, to savor every bit. Congratulations! Children and novels — oy. I rewrote a lot of Mr. Churchill's Secreary when Kiddo was a baby. During naps. I think that's why my scenes are the length they are (they are nap-length) and why I was so obsessed with 40s women's fashion (I was in yoga pants and spit-up stained shirts most of the time....). "I’m a big believer in the chaos theory of writing: that the stories you stumble into in that dark closet of your mind, tripping over spare characters, and sending odd bits of plot crashing around and banging you in the back of the head, are much more interesting than the ones you keep carefully dusted on your shelf, ready for use." Thanks for that, Lauren. Sounds like an excellent approach. Okay, The Other Daughter is now on order. I love your books. The Carnation series is so much fun! And the stand-alones are fascinating. I've read them all as soon as they were released. And I will pre-order anything you write. I like series. I enjoy the character development that takes place from book to book. I have a tendency to re-read an entire series before the next book comes out. But I must say that your non-series books have been so good that I may change my mind on preferring series. Good luck with this release, Lauren. I'm loving the book so far. Great opening line, BTW! Congratulations, Lauren! I've been a fan since Pink and I'm midway through Moonflower now, having promised myself that once I finish it, I'm going to go back and re-read the series straight through from the beginning. Love them. I want to say I like the idea of an open-ended series myself, but perhaps that's because that's what I'm writing myself. I might like them as a reader also, because we get to go on the adventure with the writer ... but having a plan for a set number of books didn't hurt the Harry Potter series, now, did it? I'm just glad Reds and friends are writing so many series I love to read! Hi, Lauren! I love your books. I discovered you when I won The Garden of Intrigue a few years ago! Of course I loved it! I am definitely and open-ended series person. Truly. No doubt. No hesitation. If I like it I want it to go on. And on and on. BTW: You (and others here) might not know how much I love your books, because when I started reviewing online, I used a different name. Ancestry, B&N etc... didn't allow me to change it.